Each year 4R participates in Scouting’s Annual Food Drive. Scouts from the districts Packs, Troops, and Crews fan throughout our communities and neighborhoods to collect food for our neighbors in need. This year 30 units collected 22, 508 pounds of food to stock area food banks. This event takes place each spring. Sign up for areas usually begins at the September Roundtable and Bags are distributed at the February Roundtable. For a bag insert go here. Patches will be available after 1 June. Units can still report their food collection totals to Jim Krempel. To see the Capital Gazette's article about the 2014 SFF event go here. For this year's leader board check this out. 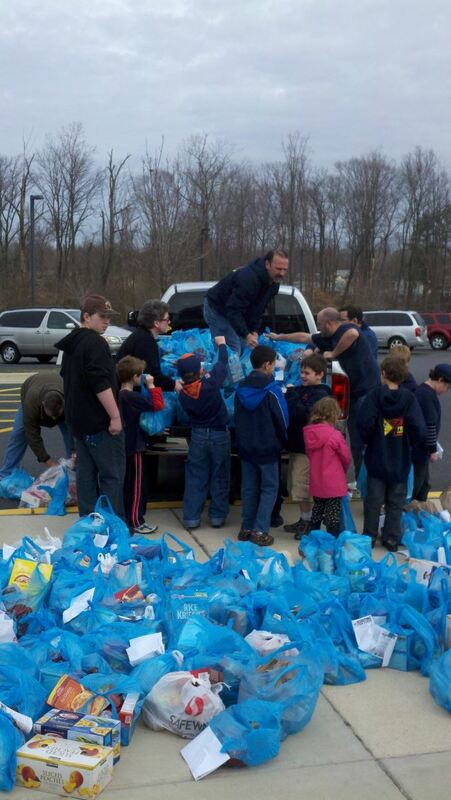 Cub Scouts from Pack 127 (Church of the Holy Apostles), Gambrills, MD load food onto the back of a truck to take to the District Central Collection Point, 2011.